Button fastening with zip fly. Side waist elastication for wearer comfort. 6 belt loops with wider centre back loop. 2 back hip pockets with velcro fastening pocket flaps. 2 side swing pockets. 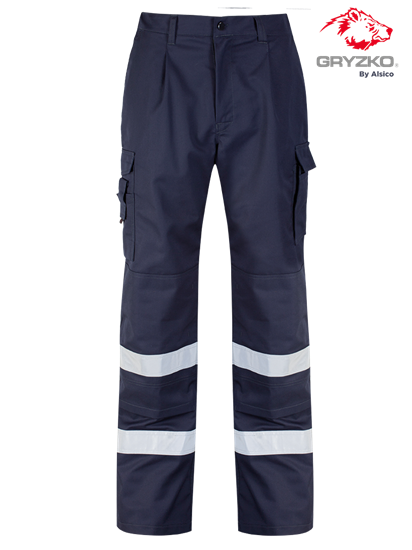 Cargo pocket complete with phone pocket to right leg, with velcro fastening flaps. Double rule pocket to left leg with hammer loop. External knee pad pocket with velcro fastening. 2 bands of reflective tape around each leg. Triple needle stitching on seat and leg seams. Twin needle stitching on reflective tape and on all other seams. Self fabric pocket bags. Knee pads sold separately (GZKP100).